The two year experiment in a voluntary application of the Indigenous Art Code of Conduct is coming to a sticky end. The Board of Indigenous Art Code Ltd (IArtC) will formally recommend to the Government that it put in place a mandatory prescribed code of conduct for the Indigenous visual art industry. IArtC currently administers a voluntary system set up to protect the rights of Aboriginal and Torres Strait Islander artists. It was established on the recommendation of the 2007 Senate Inquiry Report, and has been operational since June 2010. The Senate report recommended that the industry be given the opportunity to self-regulate and that, if after two years, persistent problems remained, consideration should be given to moving to a prescribed code of conduct under the Competition and Consumer Act 2010. ”Over the two years since its introduction, the Indigenous Art Code has established a set of standards aimed at giving Indigenous artists a fair go. 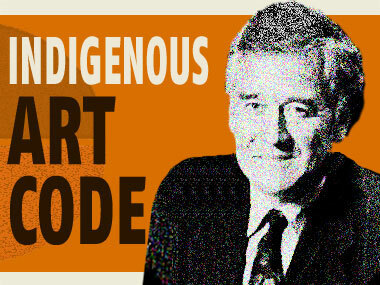 The Code has been well supported in some areas of the Indigenous art industry, attracting over 200 members. It has also been welcomed by many Indigenous artists and art centres. And it has investigated or mediated in 20 incidents and disputes. “Despite this strong momentum, a voluntary code still faces some significant challenges. A number of key galleries and agents across the Indigenous art industry have not taken the opportunity to support and contribute to self-regulation. IArtC has come to this conclusion in collaboration with the Australian Competition and Consumer Commission (ACCC) and the Arts Law Centre of Australia. The Federal Arts Ministry has also been involved in preliminary discussions as it will have to promote a mandatory Code. IArtC understands that, should the Australian Government agree to consider a mandatory prescribed code, it will undertake a thorough industry and public consultation to inform its deliberations. Ron Merkel went a little further on an ABC radio interview – pointing out that its 200 members represented only 50% of the industry, “and having given our best shot for two years, it doesn't seem like we're going to get the kind of coverage that a voluntary code needs”. However Sydney gallery owner Kate Owen begged to differ: “It has not been effective because for the first 21 months of its existence, nobody told anybody about it. So for 21 months, the board existed without doing any promotion at all, and in fact for that 21 months, my gallery and me personally spent more on promoting the code than the board of the code of conduct and the Government did”. Merkel also expanded on his understanding of why commercial galleries were resisting the Code's voluntary regulation: “Some of the good galleries felt that it might tarnish their reputation by being in the same league as some of the more suspect galleries; some of the more suspect galleries thought why should we join up because we'll be lining ourselves up for disciplinary proceedings if we breach the code and there's been controversy about whether a voluntary or a mandatory code is the way to go“. Questions might also be asked as to why the Code organisation run by John Oster didn't become a “prescribed voluntary Code” - which would have allowed the ACCC to investigate complaints and potential breaches? For a prescribed mandatory Code will be much tougher – legally binding on “all industry participants”. It'll be interesting to see precisely how that collection of artists, art centres and dealers is to be defined.